Posted on Wednesday, September 26th, 2018 at 8:00 am. We love to tout the health benefits of extra virgin olive oil from it’s abundance of anti-oxidants and anti-inflammatory properties to the studies that show it’s positive impact on heart disease and stroke. But did you know that there are links between olive oil and a reduced risk of breast cancer? Study after study has shown that a Mediterranean Diet with extra virgin olive oil can not only reduce the risk of breast cancer but may also prevent a relapse of cancer. 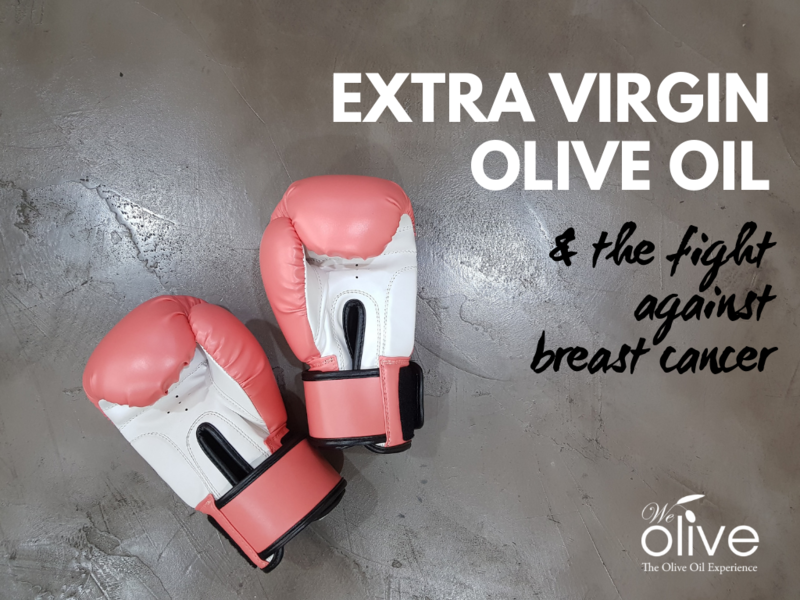 We’ve compiled a list of the most compelling data on the links between olive oil and a reduced risk of breast cancer for you here. This Harvard Study shows that women who had a high consumption of olive oil had a lower risk of breast cancer. A study in the Netherlands has shown that women who eat a Mediterranean diet rich in fruit, vegetables, fish and olive oil are 40 percent less likely to get one of the most malignant types of breast cancer. Researchers in Spain have found a molecule in EVOO that can specifically inhibit breast cancer stem cells in cell and tumor cultures. The discovery opens up promising new possibilities for directly targeting cancer stem cells (CSC), an aggressive type of cancer cell often responsible for relapse in cancer patients. Read more. A randomized trial shows that consuming a MedDiet supplemented with extra virgin olive oil reduces invasive breast cancer by 68 percent. Learn more. A new study suggests that Mediterranean diet including generous amounts of olive oil may reduce the risk of breast cancer relapse compared to a normal diet. Learn more.